The Nature Conservancy of Canada (NCC) has completed the first stage of a major research and mapping project on freshwater rivers and streams in eastern Canada and the United States. This is the first classification of streams and rivers to be mapped across New Brunswick, PEI, Nova Scotia, southern Quebec and the northeastern United States. The information is now available online to conservation groups and the public. Its goal is to support conservation for Atlantic salmon and many other freshwater species. 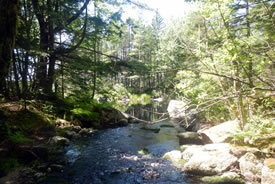 The project will inform better planning and conservation across watersheds, provinces and even between Canada and the U.S. Data is provided for cross-border watersheds in northern Maine, New Hampshire, Vermont and New York. Until now, cross-border freshwater conservation efforts had incomplete or incompatible data. The project also provides a valuable baseline for monitoring freshwater health, which may be impacted in the future due to climate change. NCC is leading the project, with 22 partners and freshwater experts from universities, government and non-government organizations. All of the partners have collaborated on the project, to aid conservation efforts region-wide. The stream classification project is funded by Environment and Climate Change Canada, North Atlantic Landscape Conservation Cooperative, Trottier Family Foundation and The Salamander Foundation. The Nature Conservancy of Canada’s stream and river classification is the first of four tools being developed to prioritize freshwater conservation and restoration in the region. The next stage of NCC’s three-year Aquatic Blueprint project will document the ecological health of streams and rivers in the region. It will also assist groups with prioritizing conservation areas. The user-friendly maps and scientific data compiled by NCC are now available online free of charge, here.